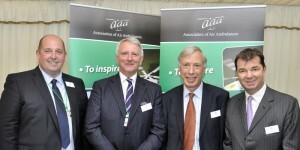 On the 11th June 2013 Lord Howe, Parliamentary Under Secretary for Department for Health, while giving a speech to a reception held by the All Party Parliamentary Group for Air Ambulances (APPGAA), made reassurances,that the thousands of pounds wasted through the application of VAT on aviation fuel was being taken seriously and a potential solution was being considered. The comments were welcomed by Guy Opperman MP for Hexham and Chair of the APPGAA: “Following the public’s clear statement in 2012 with an online petition which reached over 150,000 signatures, I and a number of MP’s led a debate in the House of Commons in July 2012. We have then continued pressing the Treasury to review the situation. I welcome the Ministers Statement and look forward to hearing how the rebate system will work. The Association of Air Ambulances represents the majority of air ambulance charities, ambulance services and the supply chain throughout the UK and it supported the Reception which was the first of its kind, bringing patients, charities, ambulance services and legislators together.